The Benchmade Hidden Canyon Hunter 15016 Knife is made to perform under many circumstances, most of them as challenging as possible. This is a product that will withstand the test of time, giving you the reassurance you need that you are going to be able to use it time and again and for as many hunting seasons to come as possible. Let’s look at what makes it stand out from the crowd. One of the essential features of this unit is its stainless steel blade. According to the claims of the manufacturer as well as the feedback received by the knife from hunters just like you, the blade retains its sharpness for a long time, and since it is well-balanced, it has excellent edge qualities. Besides, the material that it is crafted from renders it rust-resistant, so that’s one less thing to worry about. When it comes to reliability, this model definitely seems to be a winner in this respect. 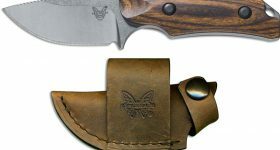 If you didn’t know and you’re getting your first hunting/skinning knife, fixed blade alternatives are far more reliable compared to their counterparts, and that’s because this particular feature puts your mind at ease with respect to potential injuries or times when the knife could have performed better due to the blade mobility. Fortunately, you won’t have to encounter any issues if you decide to go for this Benchmade option since it is a fixed blade full tang knife. The simplicity of its design highly recommends it, and we have no doubt that it will become one of your trusted friends. There’s also something to be added in relation to the size of this tool. Some knives can be too large or a little heavy, which makes them cumbersome both with regard to transporting them (since they occupy a lot of space in your hunting bag or backpack) and both with regard to the user experience. 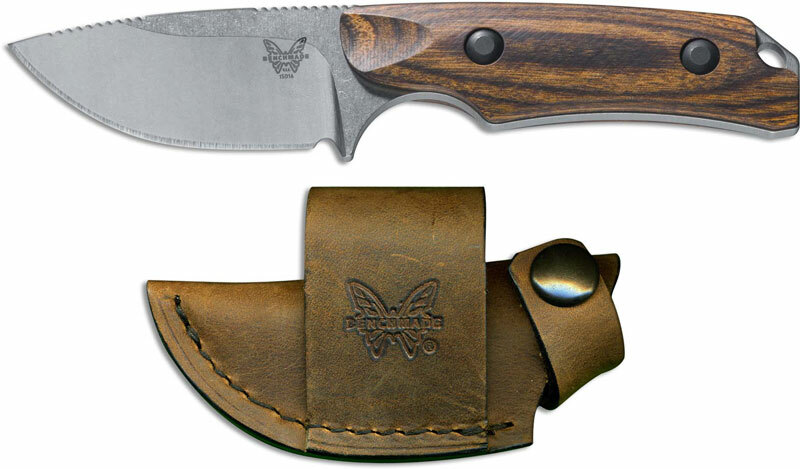 The Benchmade 15016 Hidden Canyon Hunter is compact and lightweight, allowing you to maneuver it conveniently and effectively, but it also gives you the advantage of a highly portable design. Another aspect that makes this unit stand out from the crowd is the leather sheath that accompanies it. It is ambidextrous, so it can be used by virtually all hunters. Besides, this accessory can be comfortably attached to your belt – horizontally – which makes transporting it even easier. This factor adds to the space-saving design of this product. One mistake that some hunters, especially those that are the beginning of their learning curve, tend to make is that they will use just any kind of knife they have in their kitchen for hunting purposes. Needless to say, this can have a negative impact on their performance, especially when it comes to skinning. You need a sharp tool that can be maneuvered effectively, and that’s what Benchmade has created. The knife boasts a drop-point large-radius blade that takes the cake when it comes to removing the meat off the bone or for skinning purposes. Since it is made specifically for hunting applications, you needn’t worry about this unit letting you down when you need it the most. Given that the needs of all hunters differ largely from one person to the next, you might want to know that this product is covered by a lifetime warranty and LifeSharp service is ensured by the brand. What that means for you is that you can give it a try and, should it fail to meet your expectations, you can simply get in touch with customer support to find out how you can solve the issue or whether you can opt for a different alternative. The LifeSharp service also comes in handy since the brand will take care of sharpening or repairing the knife. One thing we do have to note is that you have to purchase the product from an authorized dealer in order to get these benefits. Since it wouldn’t be fair to showcase only the pros of this knife, we’d like to note that there have been some issues reported regarding the sheath and its usability. It has a fixed belt loop and unsnapping the safety strap takes a little time to get used to. Other hunters note that when you take the knife out of the sheath, you can accidentally cut the stitching, which means that you will basically destroy the sheath. Some users have had to restitch it as many as three times before deciding to order a kydex one for the knife.